NB This fact sheet supplements the general fact sheet A17 "Various ecological effluent treatment solutions". Self-contained sanitation through lagooning involves applying lagooning principles (see : fact sheet A21) at household level. As with a septic tank system (see fact sheet A3), the household involved is thus self-sufficient as regards the treatment of its wastewater. It mainly involves the biological treatment of wastewater through plants and bacteria. This process has actually only been recommended for a relatively short time now, particularly by environmental groups. 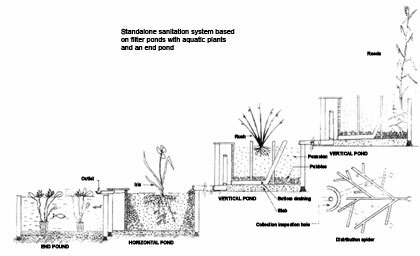 The association EAU VIVANTE has thus recommended it since 1997 and offers courses to train and assist individuals to build their own constructed wetland pond sanitation system. But this technique is probably destined to develop where the cost of excavation labour is much lower. While saving water, this technique provides much purer water than obtained by public treatment plants, and allows the treated water to be used for irrigation, water troughs and other household uses other than as drinking water. Such constructed wetlands provide a viable ecological, sustainable, low-cost and aesthetic alternative to septic tanks and treatment plants. The populations concerned are primarily those living in individual dwellings in rural areas, often far from a public evacuation network. Indeed, space is needed to install constructed wetland ponds. The family wastewater to be treated is fed through a series of vertical or horizontal constructed wetlands, each with a clearly defined role. The water flows through either vertically or horizontally. The water flows through either vertically or horizontally. 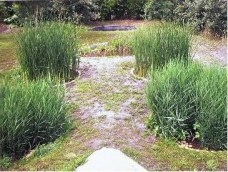 The first pond admits the wastewater where it undergoes initial treatment, passing through a vertical filter, consisting of substrates of varying grain size (from gravel to pebble, depth-wise), and planted with reeds and other macrophyte plants. The water can flow since the plant roots prevent the filter clogging. Aerobic (requiring oxygen to live) bacteria (microphytes) present in the pond convert the organic material into mineral material (carbon dioxide, nitrates and phosphates). Oxygen is supplied to them by the pond surface being aerated by the reeds moving in the wind, and by the oxygen released through photosynthesis by the plants that in particular feed off the minerals produced by the bacteria. This stage thus retains on its surface all the solids that have not been filtered at the inlet by the bar screen (mesh/filter retaining the main solids when the wastewater is admitted (See Fact Sheet No. A18). It forms a layer of sludge that has to be removed every 10 years or so, and which then forms an excellent type of humus, which is ideal for naturally fertilising the land. The second pond is also of the vertical flow type and works the same way but with a finer grain size (sand above), which improves purification. The third pond is of the horizontal flow type. The purification of the clear water it contains is completed through the plants and bacteria present. The plant roots also have the virtue of releasing colloidal agents that "break up" the large molecules present in drugs or detergents, thereby destroying this chemical pollution naturally. The treatment can be completed by an end pond containing fish which are a good biological indicator of water quality. The configuration, number and size of the ponds has to be tailored to each situation, according to the slope and size of the plot of land, the number of people, etc. It cannot be left for long unattended. The price varies greatly depending on the selected technique and size, the type of land and the work required, the labour cost and the country. For a family of 4 people in France, the prices observed have ranged from €1000 to 2000, or more. In Germany, the investment has been estimated to be €1800 for a similar system of the constructed wetland type. Although the recovered water can be used directly for irrigation, the cost of the water saved or connecting to a sewer should also be deducted. This involves the low cost of gardening. Many organisations report the interest, or even the need, to make joint use of this dry toilet purification system. Human waste, which is a major source of pollution, can thus be treated separately, and the space required for the treatment of soapy water (called "greywater") is then divided by 3 compared to the space required for combined greywater + blackwater (toilet water) treatment. This also allows the use of each of these two techniques to be optimised in a perspective which is both ecological and inexpensive, especially in terms of energy. Another water purification system that can be used at family level, although most often used as an additional system at the outlet of a conventional treatment plant, is the filter bed system. This process involves feeding wastewater pretreated in an all-water septic tank into a sand filter bed through drains. It costs less and its maintenance is very simple. 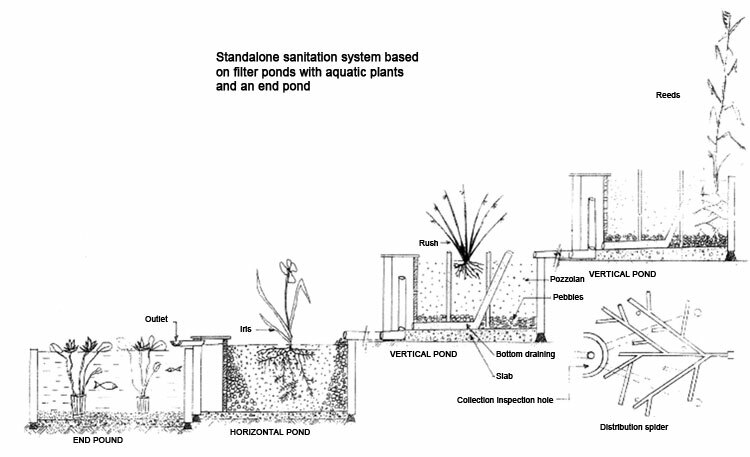 This process is described more specifically in fact sheet A23 "Filter bed purification." - "Eau Vivante", association advocating the use of dry toilets and phytopurification (purification by plants) and participating in humanitarian development projects. 3-page document on the environmentally-friendly use of water including the treatment of wastewater through the use of aquatic plants. - "Environmentally-friendly dwelling" : Fact sheet on phytopurification and on the advantage of combining it with dry toilets.